This Cichlid comes from the streams, ponds, and jungle pools of Central America. They are found in El Salvador, Panama, Guatemala, and Costa Rica. In the wild, these fish prefer moving water with cover from rocks and sunken branches. Aquarium Convicts love cave areas such as stacked rocks, over turned flower pots, and beds dug out under plants. They are a hardy fish and can adjust to a variety of water conditions. These are excellent friends for Cichlid specialist beginners. This is not a great fish for your friends in a community aquarium. 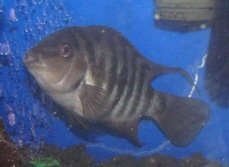 They should only be kept with larger fish, prefably Cichlids, because they will try to bully fish that are twice as large as they are. Good tank mates are aggressive Cichlids such as Oscar, Jack Dempsey, Red Terror, and Firemouth. Females are unusually brighter in color than males. Females also tend to be smaller and more round in shape. A female will also develop bright orange patches on their bellies in adulthood. Males are larger and have more pointed, extended fins. Your Convict will create a micro-habitat home by digging a bed in the substrate under a plant, rock, or cave. They vigorously defend this home territory, even against much larger fish. These little guys are enthusiastic feeders. They will hit any food you put in the aquarium hard and fast. As with most Cichlids, this little guy will destroy plants unless they are rooted very well in the substrate. I have plants tied to small bags of rocks. These fish are awesome parents and can spawn at around two inches, or 16 weeks old. Spawning courtships are short and the female will lay eggs in an over turned flower pot very quickly. Use a tank divider if you have not placed the spawning parents in a seperate tank. They become very aggressive when defending their eggs and fry. Once the eggs are laid, the female fans them with her tail and stands guard. While this is going on, the male prepares multiple beds in the surrounding substrate for shepherding the young fry. When the eggs hatch, the fry will be moved from bed to bed for safety. The eggs hatch in a few days, usually less than a week, and the fry are free swimming in about 72 hours. The fry will eat crushed flake food or baby brine shrimp. An interesting parental instinct of this fish is to bury their fry in substrate if they feel threatened. These fish are great parents and you can easily end up with over a hundred juveniles if care is taken. For more details, see Wikipedia's Convict Cichlid page.